Here is an easy step by step tutorial on how to install WordPress easily and quickly. We have complete guidelines to help you create your WordPress blog. Installing WordPress may sound easy but configuring it to run fast and smooth require lots of attention. This is why this page exist, to help you setup and configure your WordPress blog correctly. Both Auto and Manual mode have their own advantages. It will be explained below. WordPress could be installed automatically just by clicking Install button in your hosting control panel. We would split it into two categories. To install WordPress with control panel (cPanel, Plesk, Webuzo, or Custom Panel), just navigate to ‘CMS’ or ‘Blogging’ categories and click ‘Install’. Sometimes it is labeled as ‘WordPress’. Fantastico has special category for WordPress. Installing it is easy. Just click an install button, choose domain and path to have WP installed. You could configure title, description and database prefix if you want it. It almost identical with Fantastico. You just need to click ‘Install’ button and everything will run automatically. Install WordPress automatically and Manually using appropriate methods. Some of our readers were asking us if it is possible to install WordPress automatically without using Control Panel. We don’t have straight answer for that question but we could say it is possible to install WP automatically without control panel. However, we can only do it through Console/CLI (Command Line Interface) and script. There are groups of peoples whom developing script to install and configure WordPress automatically without the need of control panel. The script is capable to install WP correctly and configured to work flawlessly with selected Web Server. Some codes were placed in GitHub and other public areas. This type of installation is only recommended for people whom capable to manage server. Without control panel installed, everything is done through CLI, however, some scripts enable user to use basic GUI (Graphical User Interface). There is benefit using this method. The CPU and Memory usage could be reduced as low as possible because it has no control panel installed. To install it, you just need to point into the location of the script and execute it. Database and path of the installation could be customized in that script. Installing WP with manual installation is fun and challenging. We could customize many things as our wishes and best of it, we could maximize it based on server specification. We have divided the tutorial into two sections. Some peoples prefer control panel with no Softaculous and Fantastico installed to save money. They believe both applications/Add-on were rarely used and the money to purchase it could be used to extend hosting/server. We have divided it into three categories. WordPress could be installed from FTP. To do this, We just need to download WordPress installation files to our computer and upload it to the server. Next step would be accessing the file using browser and configure it as our wishes. Tips: Create directory matched the name of domain and upload WP installation files in it. Database could be created with PHPMyAdmin. The step is easier than through FTP. We just need to upload installation file to specified directory and configure it. Some Control panel allow remote upload which mean we could download WordPress installation files directly to the server. Tips: It is better to upload compressed files and extract it after being uploaded. It will save time and bandwidth. WinSCP is server management tools which capable to manage files remotely. The step is identical with using Web FTP. Tips: WinSCP could be used to manage and configure file system. Database shall being created manually using CLI. It is an advanced method which is easy but not recommended. Console is best to be used to manage server and not for an easy installation. To do this we just need to download files from WordPress repository and save it in correct directory. We can use ‘wget’ command to retrieve file and ‘extract’ command to extract it. Database could be created by using MySQL root user. In conclusion, To install WordPress, you just need to extract installation files to appropriate directories and configure it correctly. There are two types of installations, Automatic and manual Installation. Automatic installation is available through Fantastico, Softaculous and CLI while Manual installation available through FTP, WinSCP and Console. As author of Developing WordPress, we recommend anyone to use Automatic installation as it is fast and require less attention. 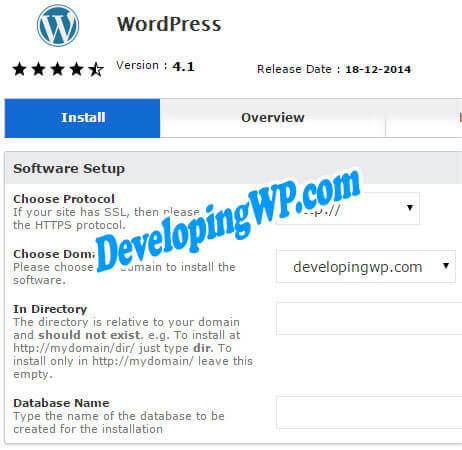 WordPress installation using automatic and manual method.